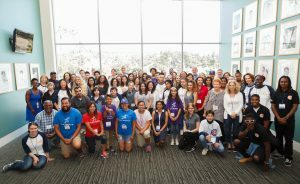 The 2018 SoCal Youth & Next Gen Regional Gathering is an exciting day-long event for youth philanthropists in Los Angeles. For the second year, the Frieda C. Fox Family Foundation, along with our partners, invites you to connect with the youth philanthropy community in Los Angeles for an opportunity to learn, network, and to experience a youth-led Giving Circle. Youth philanthropists (ages 10+) and their adult supporters (relatives, staff, etc.) are invited to attend! We know that SoCal is home to numerous Junior Boards and youth philanthropy programs. Our goal is to further develop youth philanthropy in Southern California. Connect with youth philanthropy peers and learn about new grantmaking models. Explore this year’s theme, Youth Organizing, and gain new skills. Participate in a youth-led Giving Circle and make grants (totaling $25,000). Gain service hours by completing hands-on service projects that benefit the community. The event cost is $50, which covers all meals for the day. Thanks to our wonderful partners, staff time and other resources have been donated to support the event. There is no profit being made, our goal is to strengthen the relationships within the youth philanthropy community. Become a sponsor. We still have openings for local sponsors who want to be a part of the growing SoCal youth philanthropy movement. Please contact Alexis at [email protected] for sponsorship opportunities. Share the event information with your community. Email [email protected] or call (805)836-0661 if you have questions or would like to attend. This series will feature experts from the field of youth philanthropy, and adult participants receive real-world examples and resources to be integrated into their own youth philanthropy programs! Click below to learn more and register for these FREE webinars! Ever attend a meeting and wonder why you came? Dekko Foundation youth and staff presented best tips and tricks for facilitating fun, energetic, and successful meetings. Check out the webinar recording here! Diverse groups bring a variety of opinions to the table to better impact the community. Hear examples and strategies on how to recruit diverse youth and create opportunities to engage with them! Click here to listen to this recorded webinar. The giving season is fast-approaching, which means an abundance of stories in the media about giving and engaging youth and families. Learn how to best develop and place stories of youth philanthropy programs, grants, and youth grantmakers! Click here to listen to this recorded webinar. Learn about the top resources from across the youth philanthropy field. Click here to listen to this recorded webinar.